(b) mechanical parts for Boeing and Airbus. In the past two years, SAM secured new contracts from Boeing and Airbus, resulted in increase in order book to RM3.5 billion. To cater for the higher demand, SAM is investing RM100 mil in a new manufacturing plant in Penang, which is expected to start generating profit in 2018. When come to investing, I am a bit kiasu. I prefer to enter a bit early rather than chase when the stock runs. As such, over past few weeks, I have started accumulating. Hopefully Durians will start raining in 2018. (a) The group performed well during the period from June 2015 until March 2016. However, from June 2016 onwards, earnings had weakened markedly. I noticed the followings : thinning of margin (caused by weakening of USD ? ), and decline in revenue of aerospace and semiconductor equipment divisions (which accounted for the bulk of revenue). (b) Apart from currency effect, one possible reason for decline in aerospace profitability was start up cost for the new Penang plant. (c) Performance of Precision Engineering division was impressive. It commanded EBIT margin of more than 30% consistently. I would like to find out more about this division. (d) PBT staged a strong rebound in latest quarter, back to the RM15 mil level seen in 2015. Aerospace division continued to be weak (both in revenue as well as margin). Equipment division surprised on the upside, delivering a robust margin of 14%. This single handedly pulled up entire group's performance. Management attributed that to better product mix. But I doubt the performance is sustainable going forward. Precision Engineering continued to shine, contributed more than 25% of EBIT based on less than 10% revenue. Amazing !!! (e) If not because of higher effective tax rate of 36%, latest quarter EPS would have come in very strong and caused a re-rating. Thank God that was not the case, otherwise I wouldn't have the opportunity to build up my stake recently. It seemed that the group has exhausted its tax credit. But the recent RM100 mil capex should result in lower tax rate going forward. Happy days ahead !!! (f) One of the most striking observations arising from the analysis above is how small the group's revenue base has been. For example, over past 12 months, total revenue for aerospace division was only RM300 mil. What is the implication ? The implication is that the RM3.5 billion order book should have a huge impact on prospective earnings. According to this article by The Star, SAM's new plant will start generating profit in 2018. Despite being a supplier to Boeing, I am not very concerned that SAM will fall victim to US protectionism. Firstly, protectionist measures are easier said than done. Apart from Trump's threat of punitive tariffs for US companies that close down factories and move jobs overseas, Congressional leader Paul Ryan is promoting a Border Adjusted Tax whereby import will be taxed while export will be exempted. However, to date, these proposals had not gained widespread support. They will face serious objections from various US interest groups. Even if they eventually take off, US' trade partners (especially Europe and China) will not sit idly and do nothing. Most certainly, they will retaliate by imposing tariffs on American products. Secondly, even if there is a Border Tax, Boeing as a major exporter, will benefit from the export tax exemption. This should allow it to absorb the higher cost arising from the import tax. Boeing is one of the very few American export success story. The U.S. government is unlikely to create policies that jeopardizes its worldwide competitiveness. I notice that many investors do not like to take position too early. There is merit to that practice : you are not so exposed to potential risks that might crop up during the waiting period. However, I believe it comes at the expense of lower safety margin. If you only start chasing a stock when it starts running, you expose yourself to bigger downside risk in the event of negative development such as earning disappointment, etc. I am the kind of investors that prefer to enter a bit early. 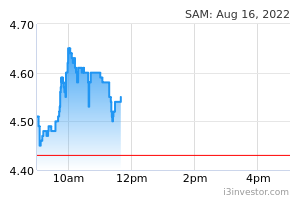 If SAM's earning indeed spikes in 2018, I believe stock price might get re-rated as early as September 2017. By buying now, I am acting just 6 months earlier than everybody. For me, an extra 6 months wait is nothing when come to investing, especially if I am very bullish about the stock. I have high expectation for SAM. The group has set a target of RM1 billion revenue by 2019. The bulk of the increase will be from the aerospace division, the revenue of which is expected to increase from estimated RM300 mil in 2017 to RM800 mil by 2019. I expect 2018 aerospace revenue to be somewhere in between (probably RM500 to 600 mil). That should result in a huge jump in earning by next year. I am hoping share price can reach RM7, 10 and 15 by end of 2017, 18 and 19 respectively. I introduced D.E.T.S. as my portfolio for the year 2017.
stockmanmy well argued and a good proposition. But only one question....why is Temasek so generous to Malaysia and not put it in Singapore? VenFx Follow the big boy money first. soojinhou Thanks for the article Icon. Just a note, SAM's profit will not jump suddenly because they have completed the new factory. That is because the delivery of the engine casing is catered to the production schedule of the customer. There's no point making hundreds of engine casing when your customer is making only tens of aircraft per year. The contract for engine casing are multi decade contracts for specific no of deliveries per year, and there's no point delivering more than what the customer needs. In short, SAM needs to secure new parts to boost it's profit. With the additional capacity, yes things are looking up indeed that they can secure more parts. Their profit may increase somewhat, but won't suddenly see a massive jump just because they have completed the new factory. Stockmanny, you need to go back in history and understand how LKT became SAM. LKT was initially a precision engineering and semicon equipment manufacturer before its present owner bought it over and transform it into an aircraft parts manufacturer. That's why it is listed in Malaysia, because LKT was listed in Malaysia. Icon8888 Thanks for your comments. I believe the pace will be faster than what you describe below. As far as earning is concerned, I am guided by managements August 2016 presentation which expects aerospace revenue to increase to RM800 mil by FYE March 2020 (which is essentially calendar year 2019). moneySIFU Thanks for writing & sharing, Mr Icon. Thanks for good comment, soojinhou. It's always great to see comment with wisdom & knowledge rather than simply ask without clarifying the fact earlier. musangfoxking i am a great believer in Icon8888! becos of him, i made big monie in Kesm!!! certainly i will consider this counter again, i still have some shares here!!!! thanks for sharing Icon...hmm...its getting harder to find gems. musangfoxking very low probability for not doing well leh!!!! KhooTeckJin75 Hi Icon, do you mind explaining why will the tax rate be lower whenever there's capex? paperplane The reason drop due to what reason? Not following for some times. What is the PE/EPS u used to come out the TP below? KLCI King The CEO of SAM has been shouting to achieve 1bil sales since 2012, what happened now? . No more mention 1bil sales target & 3bil award, suddenly all talked about F1 in AR2017. HAHA, ANOTHER JOKE! Page 1 & 13 of AR2015 said: We will rock to claim 1 billion records. WHERE IS IT NOW? Page 3 of AR2014 declared: half way to bil ringgit destination. WHAT A JOKE! Page 6 of AR2012: SAM Malaysia is on the offensive to cross over the RM1 billion revenue. GOOD JOKE!